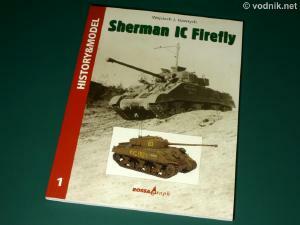 "Sherman IC Firefly" book by Wojciech J. Gawrych from Rossagraph is the first book in their new History & Model series. This is a soft cover release, 300 mm x 220 mm in size and it contains 72 pages printed on very good quality paper with excellent color and black and white photographs and also some drawings and scale plans inside. The book is a bilingual release, but only a part of the book was translated into English, while the rest is Polish only. All photo captions are however available in two languages. 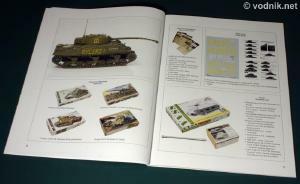 The book start with a 9 page history of the British Firefly variants of M4 Sherman tank. This part of the book is illustrated with several clear black and white historical photos (and also one b&w picture of Brussels museum exhibit). While the text in this chapter is bilingual, it is worth mentioning that the English version is abridged. Several paragraphs present in Polish text were omitted or shortened in English version to make room for a specifications table on page 12 of the book. 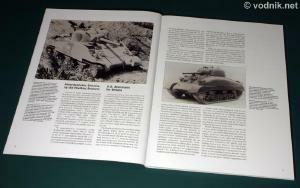 On the next four pages of the book is a short description of basic M4 tank, which was a basis for Sherman IC Firefly conversions. On those pages we get two drawings and 1/35 scale plans, including interior layout diagram reproduced from official US manuals. Following seven pages focus on the history of use and deployment of Sherman Firefly tanks in Polish Armed Forces during the WW2, particularly in 2nd Armored Brigade. Described are also camouflage and markings of this brigade's tanks. This chapter is illustrated with black and white historical photos of Polish Army Shermans. 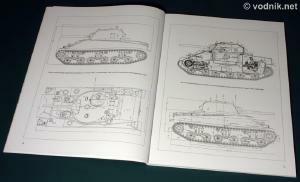 On next two pages we get two drawings from technical manual showing the standard stowage sketches and also a 1/35 profile drawing of Sherman IC Firefly tank in configuration and with stowage used on "RYCERZ 1" tank from Polish 2nd Armored Brigade. 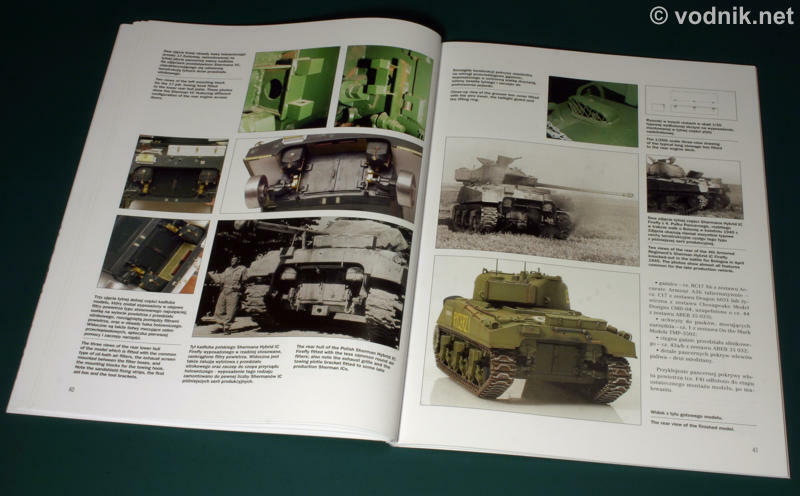 First pages 25 pages of the book are devoted to the history of the Firefly tank and basic technical information. There are some good quality black&white historical photos in this part and also some drawings and plans from technical instructions. Text is in both English and Polish in this part of the book. M4 plans from original US Ordnance Department drawings are reproduced in 1/35 scale. . There is a preview of various model kits and accessories available, which can be used to build accurate Firefly. 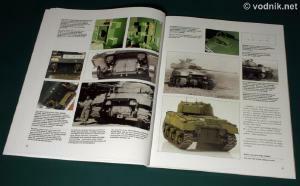 Last section of the book shows the process of building and detailing a model of Polish Army Firefly tank "RYCERZ 1". The text here is Polish only. Image captions are bilingual. historical black and white photos, color photos of museum exhibits and pictures of the model. 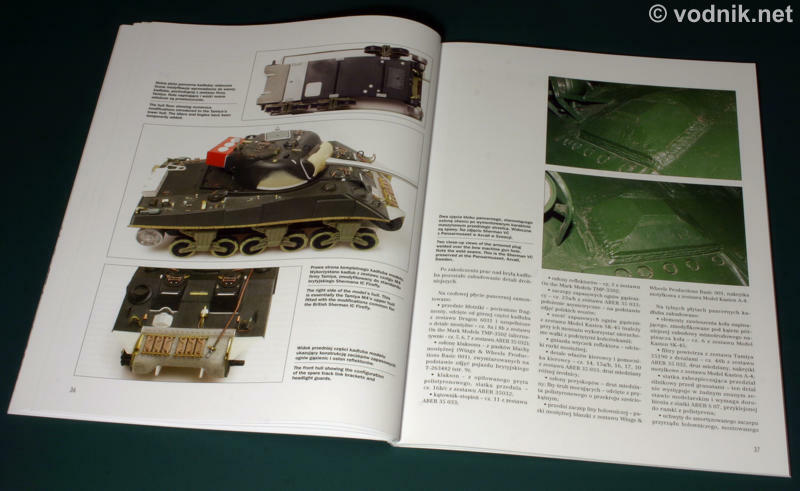 Second part of the book is devoted to the construction of accurate model of "RYCERZ 1" Sherman IC Firefly tank from Polish 2nd Armored Brigade. 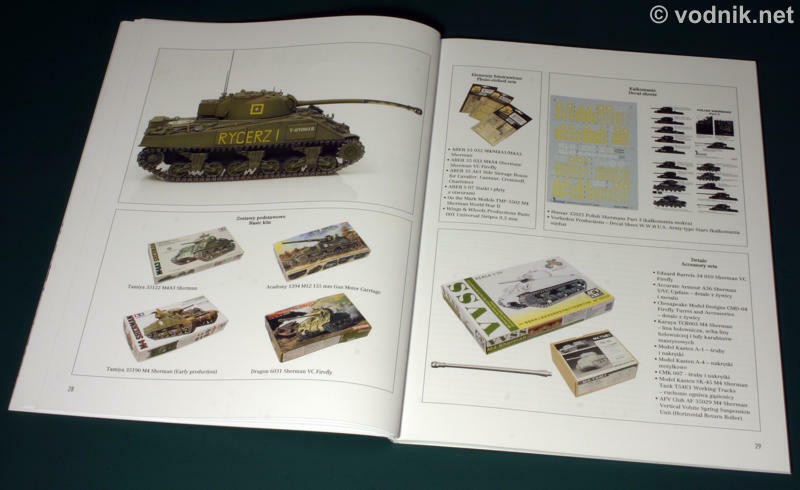 This section starts with a huge two-page photo of completed model and on next two pages we get a list of various model kits and accessories, which were used to build, detail and accurize the Sherman Firefly model. On the first five pages of this chapter of the book is a profile of "RYCERZ 1" with description of various features of this particular tank. As there are just two historical photos of this tank available, part of research was based on analysis of features of other tanks used by the same Polish brigade. As mentioned earlier the second, modeling related part of the book is printed only in Polish. English text is available only for picture captions. 30 pages of the book are devoted to very detailed and very interesting description of the process of building accurate Sherman IC Firefly model. Author used parts from four plastic kits, several aftermarket detail sets, but also scratchbuilt many parts and heavily modified some of those from kits and detail sets. 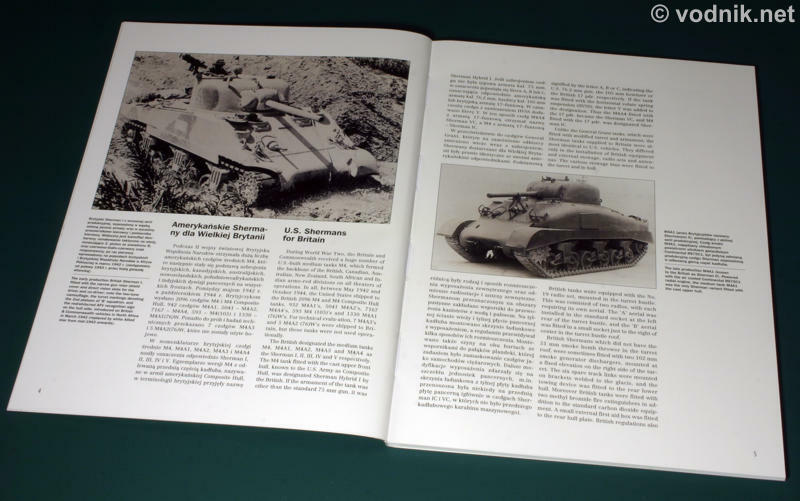 Extremely useful in this part of the book are photos, which show "in progress" model shots, close-ups pictures of details of real Sherman tanks from museums and also several historical photos. In addition to that we get a few drawings from technical manuals. Reproduced are also instructions from Modelkasten SK-45 tracks set - I hope Rossagraph got permission from Modelkasten to copy their instructions in the book, otherwise someone might consider it a copyright infringement. As I wrote earlier only picture captions in this part of the book are available in English and unfortunately they include very minimal amount of information about sources of various parts used in the model and techniques applied by the author. All this data is available only in Polish text, and it includes info about parts which were used and also about those which were not used for various reasons. This means that trying to fish names of used products from Polish text, when you don't really understand it, is very tricky, as you may find products which were actually considered useless... The list of products printed at the beginning of modeling part of the book can help, but you still won't know which parts come from which of those sets. English captions won't be helpful either if you try to find out what painting and weathering techniques were used. You do get information about the paint mix used for basic camouflage color and that's it. For more info you need to be able to read the Polish text. The modeling part of the book ends with a list of reference books and magazines used, including R.P Hunnicutt's book, Osprey title and many others. 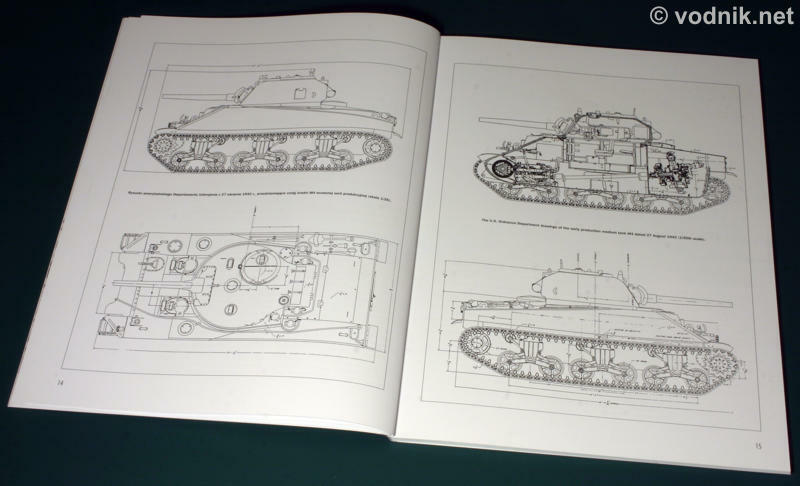 As an addendum on last seven pages of the book included is a number of photographs and sketches of the interior of Sherman IC Firefly tank. These were not used in the construction of the "RYCERZ 1" model featured in the book, as it was built buttoned up, but can be very useful for more ambitious modelers wanting to create a complete replica of the tank, including the interior components. The new Rossagraph book is a great read and very useful for modelers building Sherman IC Firefly models, particularly Polish tanks. There is one reservation however - only those who can read Polish will be able to fully appreciate the modeling part of the book. The first historical chapters are equally useful for Polish and English readers (well, almost equally, as English text is slightly abridged), but the rest of the book is a bit less attractive for the latter ones. While detail photos and sketches of real tanks included in the modeling section are of course a great reference for all modelers, the very interesting information about building "RYCERZ 1" model can however be fully appreciated only by Polish readers. English speaking modelers will have hard time trying to guess what are various parts shown on model photographs. I personally feel that it would be much better to shorten the general historical part of the book and even completely skip English text there - after all there are other English language sources of information about Fireflies available - but instead provide English translation of the text in last chapters of the book, which are much more interesting for modelers. As a minimum I would suggest adding more information to picture captions, at least English versions of them. Right now this History & Model series book is mainly a "History" one for English readers, with a little bit of "Model" added. For Polish modelers however this is really a great reference publication and can be wholeheartedly recommended. For English readers the book is also recommended, but you need to accept the fact that you are not able to benefit fully from what is included in it.